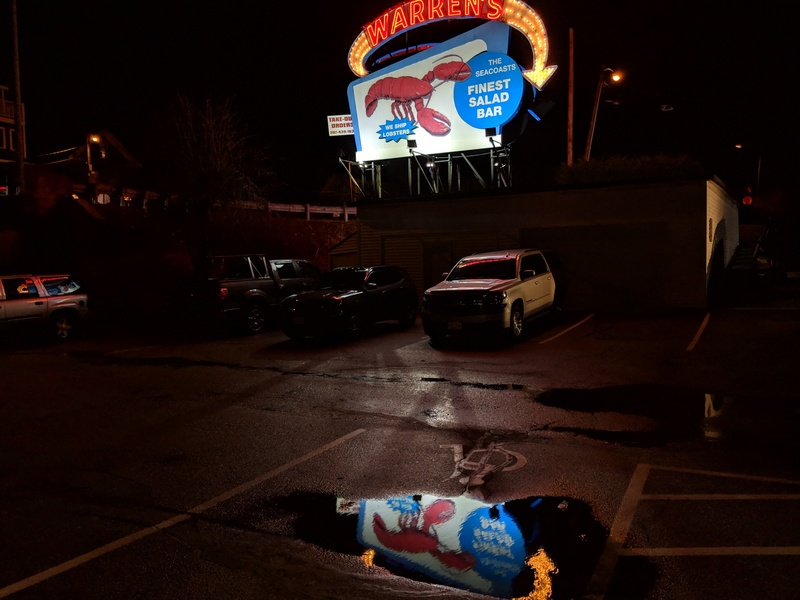 “Warren’s Lobster House”, Kittery, Maine — Reflections Of The Sign II. It was raining and snowing all day. So, there were big puddles in the parking lot. 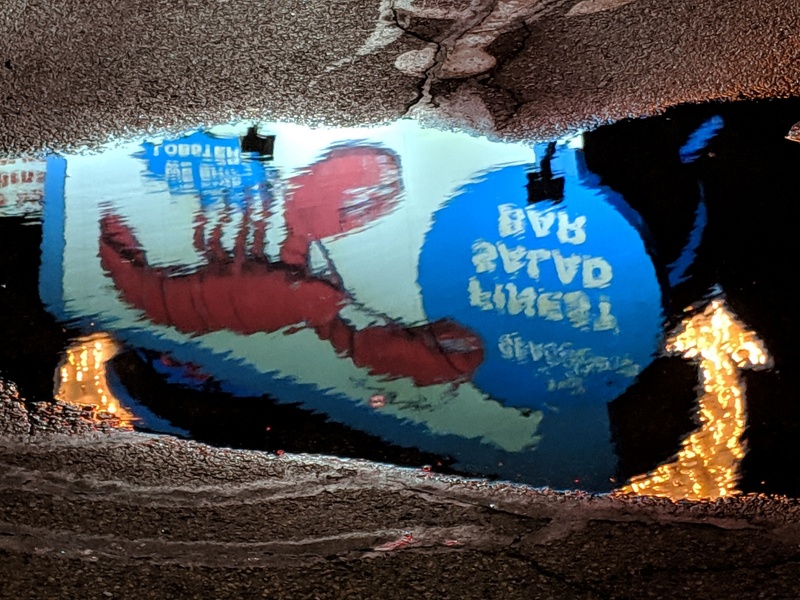 I noticed the reflection in a puddle as soon as I walked out of Warren’s. I had to take a picture. Then I noticed that I can get the actual sign too. So, I did. In February 2018 I had taken some other pictures of this sign reflected off car windows. So, this would complement that collection. Enjoy. Garmin’s Ruggedized ‘Instinct’ Is Now Available In 3 More Cute Colors. Click to access my January 2019 review. I already reviewed it in detail a few months ago. So, I am not going to rehash that. Just wanted to make sure you knew about the new colors. The yellow and bright blue are certainly eye-catching. I do like the yellow. ‘Royal Canadian Air Force’ Exercise Plan 5BX Very Effectively Exploited By Prince Charles (70). Charles at 70. From yesterday’s U.K. “Daily Mail”. Though he is FAR from my favorite Royal you have to admit, ungrudgingly, that Prince Charles looks damn good for being 70. I am 5-years younger and don’t come anywhere close. The U.K. “Daily Mail” article, which included this picture, mentioned that he has been assiduously following the ‘Royal Canadian Air Force Exercise Plan 5BX‘ for most of his life. Never heard of it. So, I went looking. Found it. Wanted to share it with YOU. When One Fitbit Just Isn’t Enough: Versa Lite & Inspire HR Side-by-Side On My Wrist. 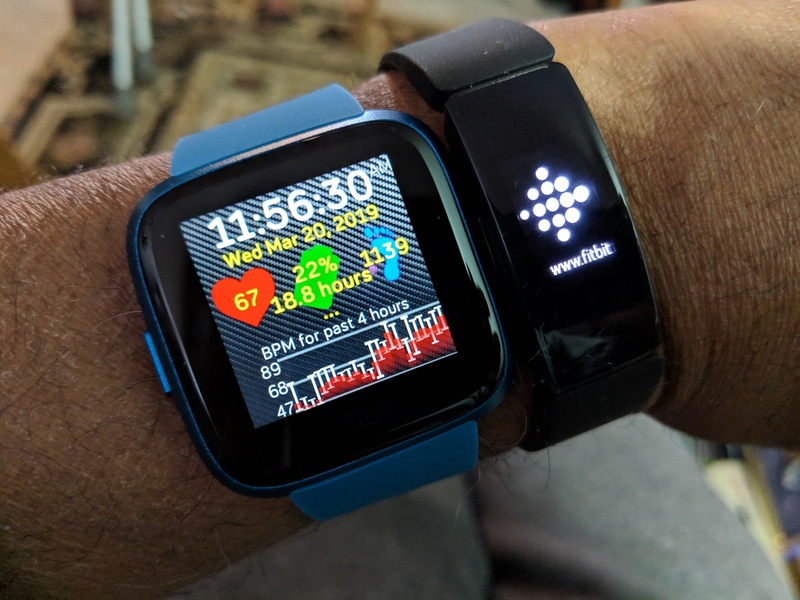 What can I say other than I was sent both the Fitbit Versa Lite and the Inspire HR, at the same time, for evaluation. Yes, I am lucky. But, it is not all fun. I do have to test them carefully and write multiple reviews. So, this is work — though it is fun. Yes, I am lucky. Right now I have: a Garmin Fenix 5 Plus, Fitbit Ionic, Amazfit Verge, Fitbit Versa Lite & Fitbit Inspire HR. There are two other Garmins in the house but they are not mine! ‘Fitbit Versa Lite’ & ‘Garmin Fenix 5 Plus’ Side-By-Side On My Wrist. 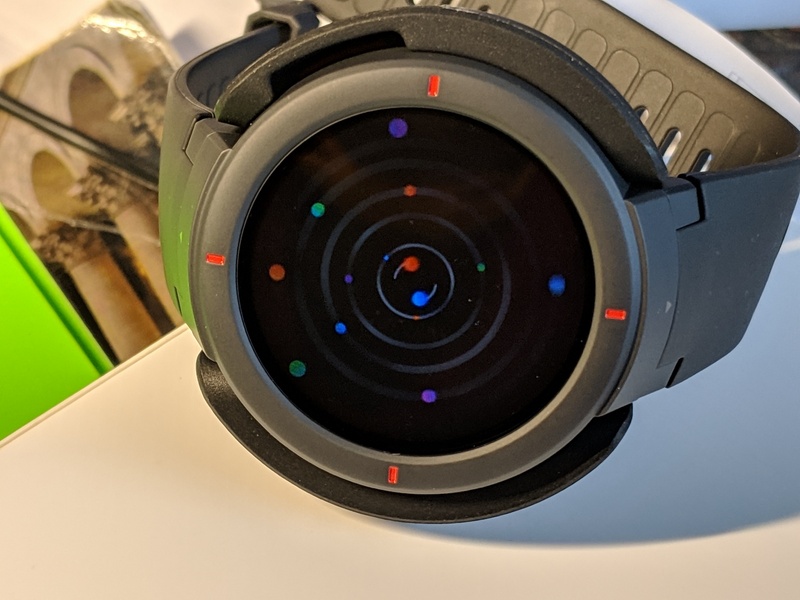 Yes, I have been asked to evaluate the Fitbit Versa Lite. It is fun. I get to try out all sorts of new activity trackers. I like it. Yes, it involves work and putting away my trust Garmin Fenix 5 Plus for a few weeks. So, far, I am impressed. Pairing was so, so simple and fast. Took less than a minute, start-to-finish! Fitbit is getting good at this. Very lite. Very cheery. I like it. I Get Both A Fitbit ‘Versa Lite’ & ‘Inspire HR’ To Evaluate. Yes, I know I am very lucky and I never lose sight of that. But, I really do have to evaluate them and I try to write at least two reviews: one short and the other detailed. I take it seriously — which is why folks send me these activity trackers to evaluate. Just heard of another one that I am likely to get in about 6-weeks. That really made me SMILE. Yes, I will share when I get it. Kind of the story of my life. That I am a conscientious and driven worker has always stood me in good staid. That I can write, or more to the point that I learnt to write and ENJOY writing, was the icing on the cake. Unsolicited Validation Of ‘Brain Meditation’ By An ER Physician Assistant (Certified). From page 61 of my 2016 “Quick Guide to Brain Meditation”. Click on image below for more details on book. As you may have read, here & here, I busted my knee, well & truly, last Thursday morning, when I fell awkwardly while shoveling snow. There was an almighty crack. Left knee was at a funny angle and there were things pointing out from it. I couldn’t get up. Finally hobbled into the house. Knee was in bad shape. Managed to pull on a knee brace onto it and that made a big difference. I could at least now drag the leg along. Made it to the ER at ‘Frisbie Memorial Hospital’ in Rochester (NH) by noon — about 90-minutes after I had done the damage. I was in some pain, but I was doing OK. I hadn’t taken any pain medication and declined the first batch that was offered to I. They did a X-ray and a contrast CT Scan (which required the insertion of 2 IVs, the 1st apparently not large enough for the contrast dye they wanted to pump into I). They diagnosed that I had completely ruptured (i.e., seperated) my Quadriceps Tendon. They gave me some acetaminophen (Tylenol) about 2-hours into my stay and a shot of morphine before I left. But, as I was being discharged the female Physician Assistant (Certified) (PA-C), from Maine, who had taken care of me throughout my 4.25 hour stay came to check up on me. After going through all the formalities, she said: “So, what is your secret? Mind-over-matter? This is fairly serious injury and you coped with it like it was not too bad“. I told her about my ‘Brain Meditation’. If you look at the top picture I had spelled all of that out, as a ‘Reward’, 3-years earlier. Ability to: module pain, coping with lifestyle change and continued serenity. ‘Brain Meditation’, as I spell it out here, has served me well over the first 6-days. I am basically pain-free. Just taking 2 Aleves a day — and that is mainly as a precaution. The Physician Assistant’s was going to check out my book. As she said, it certainly seemed to be working.